Artistic rendition of cell-permeable chemical probes labeling redox-sensitive cysteine thiols in living Synechococcus sp. PCC7002. 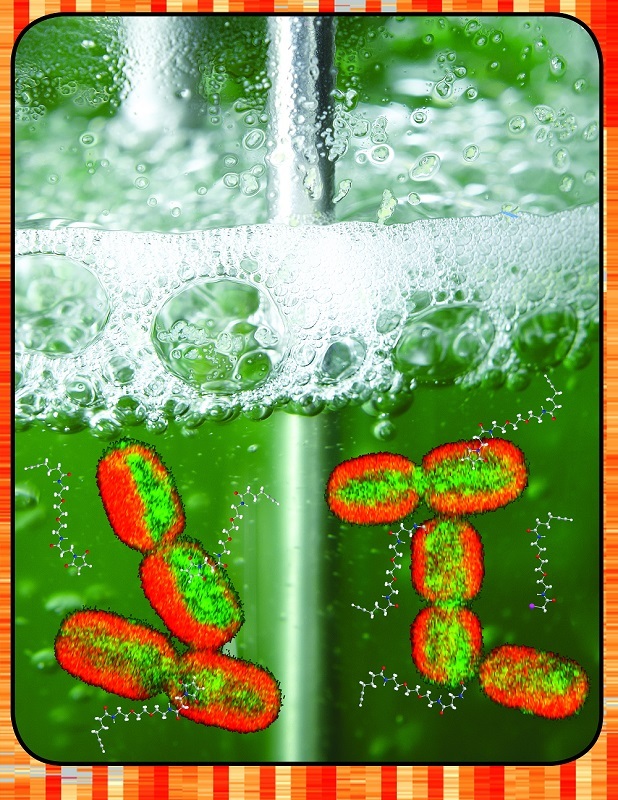 The background depicts the photobioreactor used to culture the cyanobacteria. The probes and photobioreactor were developed at Pacific Northwest National Laboratory. Enlarge Image. Scientists at Pacific Northwest National Laboratory have charted a significant signaling network in a tiny organism that's big in the world of biofuels research. The findings about how a remarkably fast-growing organism conducts its metabolic business bolster scientists' ability to create biofuels using the hardy microbe Synechococcus, which turns sunlight into useful energy. The team glimpsed key chemical events, known as redox reactions, inside living cells of the organism by using a chemical probe they developed that allows live-cell labeling. They also developed an in vivo labeling and imaging strategy to identify proteins undergoing these reactions in the photoautotrophic cyanobacterium. Their publication in ACS Chemical Biology marks the first time that redox activity, a very fast regulatory network involved in all major aspects of a cell's operation, has been observed in specific proteins within living cells. See more in the PNNL news release. The research is featured on the journal's cover, and two of the authors, post-bachelor and post-doctoral researchers Natalie Sadler and Dr. Matthew Melnicki, will be profiled on the ACS website as student authors. Sponsors: U.S. Department of Energy Office of Biological and Environmental Research Genomic Science Program through PNNL's Foundational Sciences Scientific Focus Area (SFA), Biofuels SFA, and Panomics SFA. Research Team: Natalie C. Sadler, Aaron Wright, Matthew R. Melnicki, Eric D. Merkley, William B. Chrisler, Eric A. Hill, Margaret F. Romine, Sangtae Kim, Erika M. Zink, Suchitra Datta, Richard D. Smith, Alexander S. Beliaev, and Allan Konopka, all PNNL; and Margrethe H. Serres, Marine Biological Laboratory, Woods Hole, Massachusetts. Reference: Sadler NC, MR Melnicki, M Serres, ED Merkley, WB Chrisler, EA Hill, MF Romine, S Kim, EM Zink, S Datta, RD Smith, AS Beliaev, A Konopka, and AT Wright. 2014. "Chemical Profiling of Live Cell Temporal Redox Dynamics in a Photoautotrophic Cyanobacterium." ACS Chemical Biology 9(1). DOI: 10.1021/cb400769v.